Reflections on Chicago | So Many Exciting and Beautiful Places! Seven of us left from Minneapolis at 9 am, and arrived in Chicago around 10:25, then headed to the Knickerbocker Hotel, located near the Water Tower. This historic hotel is strategically located at one end of the Magnificent Mile, close to the Lake Michigan waterfront and Navy Pier. Linda, Kathleen, Donna, Cindy in front, Sally, Debra and Mary H-L waiting at the airport. After settling in, we went to Nico Osteria for a delicious lunch. Our eighth member, Mary S, arrived from Detroit at 1:00. We picked her up and headed to the Art Institute of Chicago for a few hours. The weather is fabulous and there were many people walking outside. We spent a couple of hours there, and I could easily spend a few more. On our walk back, we stopped at Millennium Park to enjoy the attractions there, including The Bean, a reflective sculpture, and the largest of four giant heads, created by Jaume Plensa. 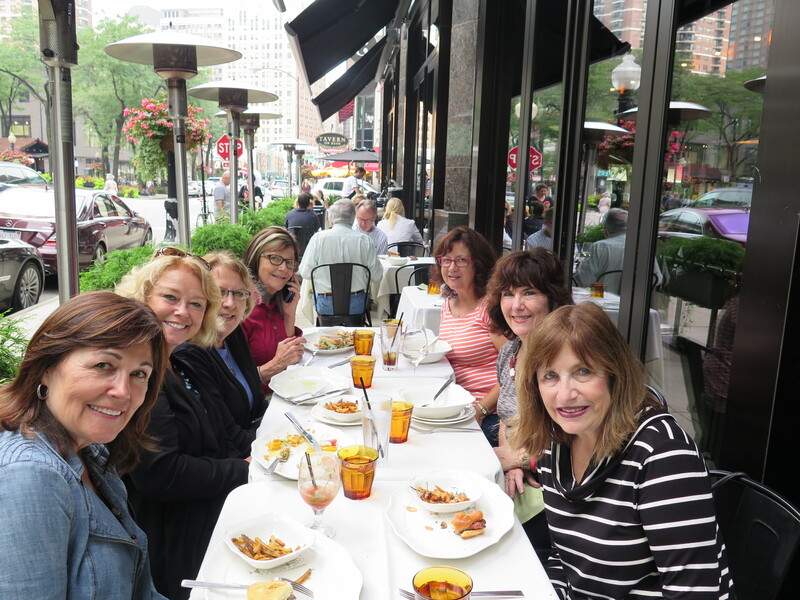 Next, we had a light dinner at Howells & Hood in the Chicago Tribune Building. Then, back to our hotel to rest up for tomorrow. This entry was posted in Chicago, USA Travel. Bookmark the permalink.